Designed with safety in mind, this deluxe insulated tool kit helps protect people, property and productivity. These double insulated safety tools are designed for communications and cable service technicians who need the added safety and protection of insulated tools. Double insulation provides a visual cue for tool failure. If the yellow shows through don’t use the tool near voltage! With this kit you'll be ready to tackle any job requiring work on or near live circuits. Our insulated tool kit comes neatly packaged in a rugged, waterproof plastic case with die cut foam interior. 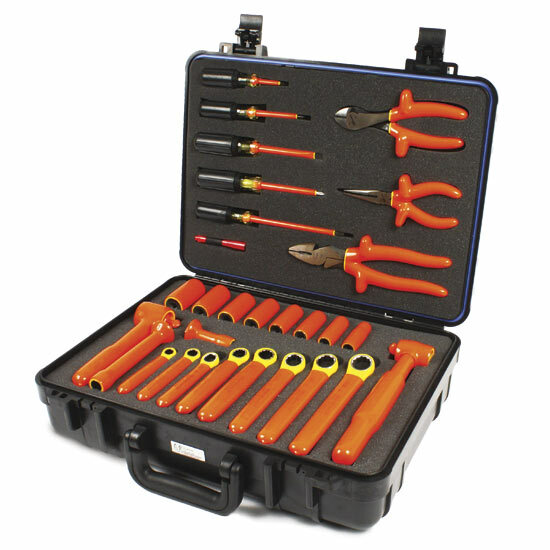 This 30-piece 1,000 volt rated insulated safety tool kit features a full set of box end wrenches, a complete 3/8" drive socket set, ratchet handle and a 30 in/lbs-150 in/lbs torque wrench. The kit also contains a full set of cushion-grip screwdrivers and a selection of the most commonly used pliers and cutters. Lifetime warranty on mechanical parts and a one-year guarantee on insulation. Full Set of Screwdrivers (5 pieces) - heat treated with tips that are grounded and tapered for precise fit. 9" Linemen's Plier - the do everything plier, great for cutting and grabbing. 8" Needle Nose Plier - long reach for tight spots. 7 1/2" Diagonal Plier - for cutting larger cables. Complete 3/8" Socket Set & Ratchet (11 pieces) - quickly remove or replace nuts and bolts. Box End Wrench Set (8 pieces) - ideal for bus bars in power systems. 3/8" Torque Wrench - reach into confined areas with added safety to deliver accurate torque. Non-Conductive Mini Flashlight - light where you need it and won’t short live circuits.